like anyone of us, don van vliet hoped to get rich and famous once. however, he made the mistake to think that such was possible by joining the pop music circus. so, at the end he got some faint fame - mainly caused by his personality act 'captain beefheart', a name immediately associated with pulp comics about supermen saving mankind. unfortunately, he couldn't make a living out of it. so - unworthy to an outer space being like him - he also had to make albums. but the successive record companies he made his beautiful music for, always managed to eventually play 'even, if ever' - which meant that he and the band had to be satisfied with the advance pay (just enough to buy a much needed pair of shoes for himself, and óne meal for everyone) and needed to tour for a more steady income. besides promoting the albums they had made - which could cause a little more to eat - the band earned some direct money while wandering through exotic countries like france, belgium, holland, and denmark! but as don liked to have all the attention, he also had to go through the obliged photo shootings. most of the time he passed the audition by staying cool amidst a chaotic herd of photographers requesting to smile, say cheese, hold still, sit down, stand up, move to the right, move to the left, look here, look there, all at the same time. and then it was off into the concert, and..: another town with a similar routine next day. or not. because the paparazzi didn't always show up in such hordes. like in the case of the following picture which presents us don posing beside a portrait of the royal family from holland on their queen's day. standing on the steps of the palace gaping at the people parading for them are from left to right princess christine, heiress beatrix with husband and the next generation of spongers, queen juliana and her man, princess -- well, who the hell cares? let's focus on the royal figure beside the portrait! 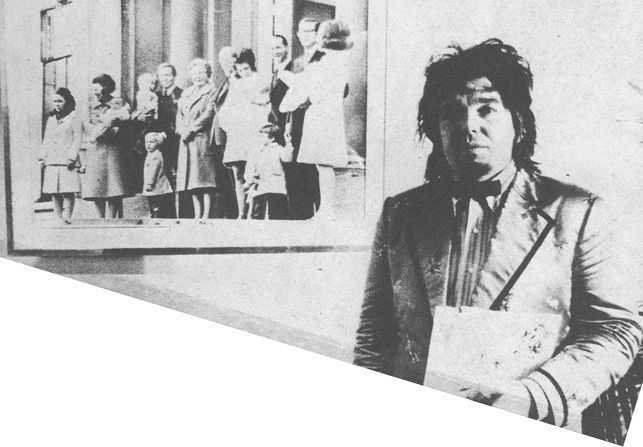 it's captain beefheart of course, wearing a sketching book and his 'spotlight kid' outfit. easy conclusion: the picture was taken during his two-day visit to holland in april 1972 (and appeared under an angle in a corner of the beefheart special from the 190674 dutch magazine OOR - that's why the lower part of it looks a bit strange). however, because such portraits of the dutch royal family hung around in a lot of public places like hotel lounges and concert buildings the photo itself doesn't indicate the place where it has been taken. the only clue to the circumstances is given by the name of the guy who took the shot. for the pop periodical had a favourite photographer for occasions like the captain's visit (who was very hot, being in holland for the first time just a few years after 'trout mask replica'). so practically all pictures from the seventies of don on and off stage published in that mag are taken by a certain gijsbert hanekroot. and, indeed, he took lots of photographs when beefheart and the band were in amsterdam on saturday 8 april. so that pic of don in his captain beefheart act and that good willing family on the background on their annual working day, actually is the set down of a historic moment: the first contact of the captain with the dutch soil, the land of his biological ancestors.